This collection is comprised of four instruments of the standard saxophone quartet. These are the Soprano, Alto, Tenor and Baritone Saxophones. This collection is comprised of four instruments of the standard saxophone quartet: the Soprano, Alto, Tenor and Baritone Saxophones. You won’t need any Giga-sized pre-recorded libraries, because SWAM Saxophones is not a recording of notes via sample libraries, but a set of real virtual instruments based on traditional saxophones. 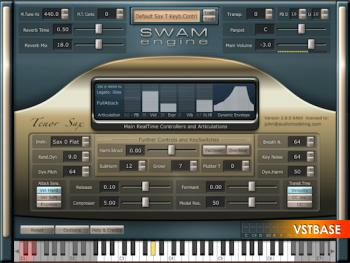 Developed by Audio Modeling using the SWAM Technology, SWAM Saxophones is the result of a combination of innovative performance techniques and concepts of physical and behavioral modeling with the multi-vector/phase-synchronous sampling technique. This collection is the most realistic, real-time controllable, expressive set of virtual saxophones on the market, and only needs the smallest footprint to create the perfect organic consistency resulting from the endless expressive parameters that are unique of every live performance. As a producer, composer or live performer, you can use SWAM Saxophones to play any musical style: from Classical to Jazz, from Pop to Funky, and any other musical style. Just layer them in a section with no artifacts and select a different instrument timbre for each instance. Soprano Saxophone: Chromatic from Gb2 – A5 in C Concert. Alto Saxophone: Chromatic from B1 – G5 in C Concert. Tenor Saxophone: Chromatic from Gb1 – F5 in C Concert (by default transposed one octave down). Baritone Saxophone: Chromatic from B0 – Eb5 in C Concert (by default transposed one octave down).